Proudly bearing the name, Land of 10,000 Lakes, Minnesota has for decades been home to some of the most passionate boaters and anglers in the world. People love the lakes up here. A lazy day boating in the sun is a favorite pastime. For most Minnesotans, time spent on or around the water is part of some of their happiest memories…. long summers at the lake, heading out with buddies for a morning of fishing, or family trips on the pontoon up at the cabin. For anglers, Minnesota is a paradise. There are over 3,000 public water access sites where you can launch a boat for free and 360 fishing piers and shore fishing sites, with free fishing available at most. The state owes a lot of that number to Lake Minnetonka. 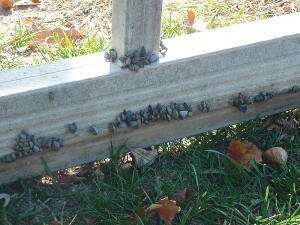 Everybody by now probably knows that zebra mussels have been found in Lake Minnetonka. They’re proliferating so rapidly that Lake Minnetonka has now been dubbed a “super spreader’’ due to the threat that the many boaters using the lake could spread the invasive aquatic species. It has been estimated at being in 80 to 90 percent of the lake. Most bays have it. 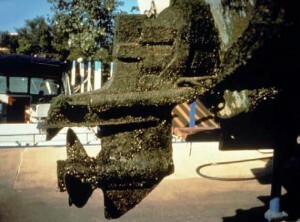 When they attach to your boat and can cause some serious damage to your boat, hull and motor. So, before putting your boat in storage for the winter, the Minnesota DNR is asking for everyone to do their part in keeping Minnesota waters free of invasive species. A watercraft inspector with the Minnesota Department of Natural Resources (DNR) inspects a boat exiting a lake and finds aquatic invasive species (AIS) attached. DNR officials say it’s a scenario they experience far too often in their efforts to curb the spread of AIS. DNR and its partner organizations have worked hard this summer to prevent boaters and anglers from transporting invasive species, but they are continuing to see new infestations and are still finding boats and trailers carrying AIS, according to Col. Ken Soring, DNR Enforcement director. The latest incident occurred Aug. 2 as a boat usually operated on Lake Minnetonka was exiting Lake Bemidji. Lake Minnetonka is among approximately 300 bodies of water in 53 Minnesota counties designated as infested with AIS. Lake Bemidji is not. The watercraft inspector found Eurasian watermilfoil and zebra mussels attached to the boat trailer. The DNR conservation officer cited the boat operator who now faces a $500 fine. Nearly 150 watercraft inspectors were stationed around the state this summer to help stop the spread of AIS. Watercraft inspectors and conservation officers are doing their job in getting voluntary compliance with AIS laws, but the real success is going to be won when each and every boater takes personal responsibility. A recent road check at St. Croix Bluffs Regional Park in Washington County found 21 percent of the 62 vehicles with watercraft or water-related equipment checked were violating state AIS laws. A road check near South Long Lake in Crow Wing County found seven of 22 vehicles with watercraft or water-related equipment inspected resulted in an AIS violation rate of 31 percent. According to the DNR, once zebra mussels are established in a body of water, they can multiply and impact both the ecology and the recreational experience of people using a lake or river. They are often transported from lake to lake by boaters. The mussels are only about the size of a finger nail, and their larvae microscopic, making them tough to find. They have been discovered in various lakes across the state. With more than 850,000 registered boats in the state, it’s important TO DO YOUR PART to ensure everyone can continue to enjoy Minnesota’s glorious waterways! These infestations underscore the need for continued diligence in complying with the state’s invasive species prevention protocols. To date, DNR aquatic invasive species (AIS) inspectors and conservation officers have reported 3,808 contacts with boaters and other water recreationists which have resulted in 369 violations – nearly a 10 percent violation rate. Failure to remove the boat plug is the most often cited violation. Although more people are getting the message and following the AIS laws, according to the DNR, there is still a 10 percent violation rate. That means one out of every 10 boaters is not taking the necessary precautions to avoid spreading AIS. With the economic impact of zebra mussels in North America during the next decade expected to be in the billions of dollars, we’ve got to do better! Clean boat by removing plants, zebra mussels and other prohibited invasive species from watercraft, trailer, anchor and all water-related equipment before leaving any water access or shoreland. Drain water-related equipment- Think of every conceivable space that can hold water (boat, ballast tanks, portable bait container and motor) and drain bilge, livewell and baitwell by removing drain plugs before leaving water access. Keep drain plugs out and all water-draining devices open while transporting watercraft. Dispose of unwanted bait, including minnows, leeches and worms, in the trash. Plan ahead to save bait by transferring it to containers prefilled with bottled or purified tap water. If people can do that every time they leave the water, it will go a long way toward preventing the spread of these mussels. 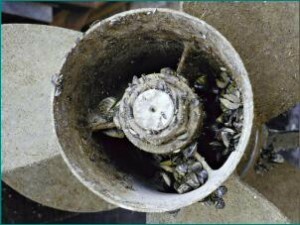 There have been reports from the public about zebra mussels attached to boats and docks being pulled out of the water for the season. 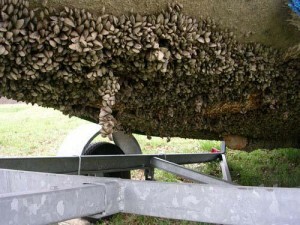 First, it is illegal to transport any watercraft with zebra mussels, faucet snails, or other prohibited invasive species attached away from a water access or other shoreland property, even if you intend to put it in storage for the winter. Second, to accommodate boaters who need to transport their watercraft at the end of the season, the DNR developed a special one-way pass, or authorization form. The form allows boaters to move watercraft to another location to clean off invasive species, and once cleaned, to storage it for the winter. More information is available on the AIS Web page.